The next project on our plate is a redo of the kids' bathroom. Right now it is a sea of white...and not in a good way. I want the room to be fun and playful, but not "over the top kid", if you know what I mean. 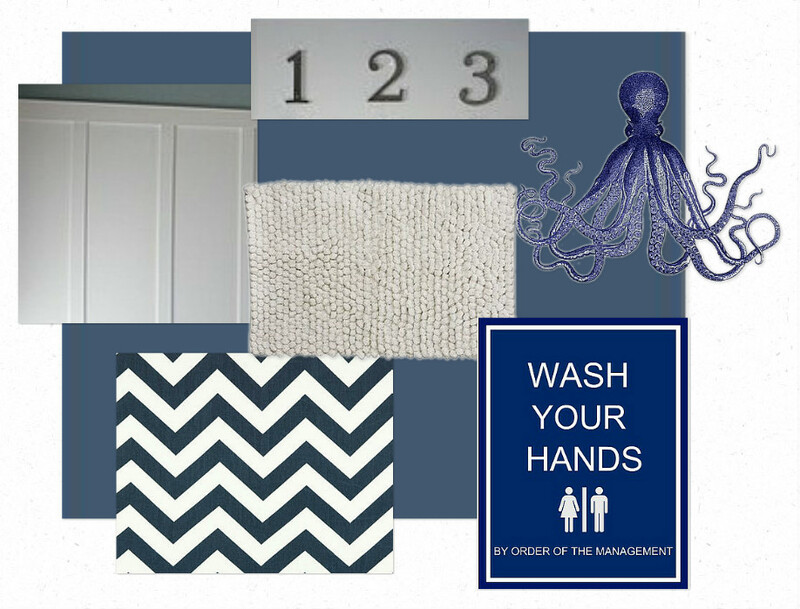 The bathroom is right next door to the boys' bedroom, and because this house is "cozy", I decided to use a similar color palette in the bathroom to give that part of the house a sense of continuity. You may recall the striped wall from my boys' bedroom. I want to use a board and batten wall treatment and bring in a bit of whimsy with the chevron fabric and the artwork. The hubby and I are planning on getting started today! Can't wait to show you the result! Great colors! I love the hand-washing sign idea. And I love the funny sign - it reminds me of one I made recently.